The organisms which bring about diseases in poultry are too small to be seen by the naked eye - a microscope needs to be used to see them. These microorganisms are: Bacteria, Viruses, Protozoa and Fungi. If the bird has a good immune system it can resist low grade invasions of these organisms. If the bird comes under stress which often lowers immunity the bird becomes susceptible and these organisms then multiply rapidly in the bird and so sickness follows. Some bacteria produce the condition of the disease in the bird whereas others just lower the bird’s resistance so allowing other bacteria to invade the bird and thus produce disease. Bacteria produce toxins which are antagonistic to the bird. The greater the number of bacteria the larger the amount of toxin produced until the bird dies. These toxins are of various sorts and affect the bird in different ways. The virulence (pathogenicity) of these organisms is a measure of how fast it produces a disease. The more virulent the faster the disease develops. This virulence may vary within a species of bacteria. The bacteria within the bird may not multiply very rapidly until conditions are right and then it explodes, multiplying rapidly so producing large amounts of toxin. This is especially so on multi aged farms where the virulence will increase as the disease goes through each batch of birds. The bird must be in a susceptible state for the disease to become established and the bird has various mechanisms to help prevent invasion. The most important of these is keeping the bird stress free. 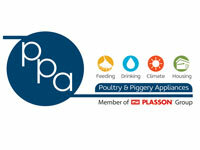 Good management in ensuring good temperature control, good feed, good housing and correct stocking densities etc. 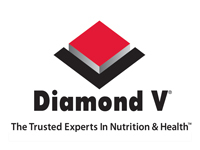 This ensures that the immune system does not weaken so making bacterial outbreaks less likely. A healthy skin free of cuts and scratches will keep bacteria out. The cilia and the mucous on the membranes in the respiratory tract will also rinse bacteria away. That is why it is essential to keep ammonia levels down as ammonia will destroy the cilia. The climate and seasons also play a role in that some diseases affect birds more in cold weather and some more during hot weather. Some species of birds are more resistant to certain bacteria than others. The bacteria will invade a type of bird and grow and multiply without producing any evidence of the disease but in another type of bird be devastating to its health. 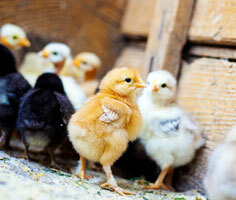 The age of the bird can have an effect on it’s susceptibility to certain bacteria. 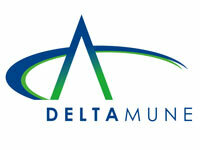 With this in mind Good Management is the most important factor in preventing disease outbreaks. Viruses are the smallest of the microorganisms that cause disease and can only be seen with an electron microscope. Most can only survive for a few hours outside of the body. They are killed by direct sunlight, heat and some disinfectants. They cannot multiply outside of living tissue and can only multiply within a host cell. They cannot be treated with antibiotics. Vaccination is the only way to prevent viral diseases. Each vaccine is specific for each virus i.e. vaccination for Newcastle disease will only be effective against Newcastle disease. These are single celled animals which are parasitic in poultry by living on the contents of the cell. They have a complex life cycle. An example of this would be Coccidiosis. Fungi are a group of organisms which include moulds and yeasts. They grow outside of the bird and can be ingested or inhaled by the bird. They produce toxins in the bird. This is caused by a virus of which there are four forms: Lentogenic (mild pathogenicity), Mesogenic (intermediate pathogenicity), Velogenic or neurotopic (high pathogenicity), Viscerotopic Velogenic (very high pathogenicity). The mild form is used as a vaccine, the moderate is often seen in birds that have not been properly vaccinated, and the very virulent form can cause extremely high mortalities in unprotected flocks. Through the air over reasonably short distances. Coughing dislodges the virus from the respiratory tract and this is then carried in the air from bird to bird..
By mechanical means. On clothing, equipment, trucks etc .This is probably the most common form of transmission and can be prevented by strict bio-security. Poor clean up periods on the farm. Short rest periods and multi age sites often result in the older birds re-infecting the younger birds. Wild birds or neighbouring poultry. Rodents can also spread it from one house to another. 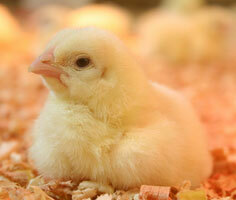 Incubation period is 4 – 6 days and the spread of the disease is very rapid. Symptoms are respiratory difficulty, twisted necks and diarrhea. The tail feathers by the Cloaca are often stained green from Bile as the birds stop eating. 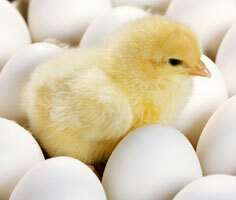 Egg production drops and eggshell quality is reduced. 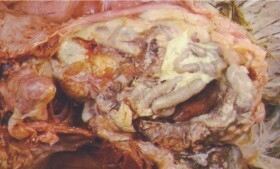 Upon post-mortem, hemorrhaging of the proventriculus is seen and lesions are sometimes found in the respiratory tract. 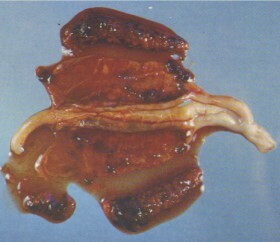 In the picture the hemorrhaging of the proventriculus can be clearly seen. There is no treatment for this disease. Birds can only be protected by vaccination. It is best to consult with a veterinarian to design a vaccination programme for your particular area and circumstances. Vaccination techniques need to be good to achieve titer levels that will resist a field challenge. Titer is a measure of antibody production or immunity. This is a viral disease which attacks the immune system of the chicken. In young birds the Bursa of Fabricius is mainly responsible for producing anti-bodies which kill off disease causing pathogens. 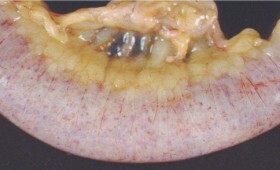 This organ can be found next to the Cloaca and when cut open has folds in it. This disease attacks this organ thus severely affecting the bird’s immune system. Incubation period is about 2 days. In a very virulent form, it can cause high mortality but normally Coli septicaemia follows on from the disease. There is no cure, prevention is by vaccination, but antibiotics are often used to prevent secondary bacterial infections. The disease is confined to younger birds. Birds become morbid, stop eating, have ruffled feathers and can have a whitish diarrhoea. Birds can often be seen picking at their vents. 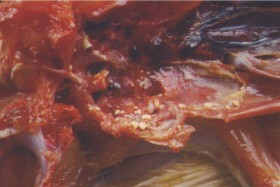 On post mortem when the skin is peeled back some haemorrhaging can be seen on the thigh muscles and sometimes the breast. The Bursa is swollen and when cut open haemorrhaging can be seen. It is best to send birds to the laboratory for a positive diagnosis. Note the swollen Bursa of Fabricius. Control should rather be by prevention so Bio-security is very important. The virus is capable of remaining viable outside of the chicken for several months so proper washing and disinfection of houses becomes very important. It is mainly spread by people and on equipment. There is no treatment for this disease as it is a viral disease, but antibiotics are often given for secondary infections. Parents are vaccinated against this disease and so the chicks are protected by their maternal antibodies up to about 2 to 3 weeks of age. Vaccinations are often given after the birds are 2 weeks old. An oil based killed vaccine can also be given subcutaneously at day old. This is the most common disease found in chickens. It is normally an opportunistic secondary infection in that it will manifest after viral challenges. It is a bacterial infection caused by E.Coli, which is always found in the intestines of all birds and animals including humans. As the chickens live in the house continuously, the environment of the house is contaminated. Normal healthy chickens can withstand this disease, but once they are placed under stress, either through bad management or other viral infections, they become easily infected via the respiratory tract. Typical respiratory symptoms are seen; snotty noses, watery eyes etc. 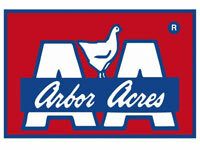 Chickens of all ages are susceptible. This condition is easy to see on performing a post-mortem on the chicken. 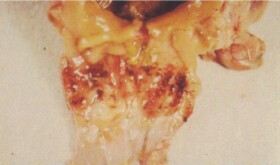 The air sacs are filled with yellow pus as well as the internal organs. See pictures below. Antibiotics can be used through the feed or water to correct it. 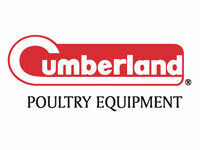 The reason for the chicken becoming susceptible to this disease needs to be found and corrected. Heart, liver and intestines are covered with the same. This is a disease caused by a group of protozoan (parasitic) organisms in the class “Coccidia”. The coccidia that inhabit the chicken are in the genus Eimeria. Coccidiosis is spread by oocysts which are shed in the droppings but are not infectious until they are sporulated. This occurs in the litter outside the chicken and takes place when conditions of air, temperature and moisture are right. It takes from 2 – 4 days to happen. 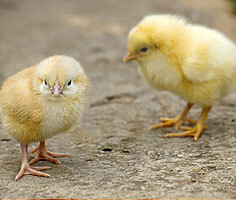 The sporulated oocysts are then eaten by the chicken and goes to the intestinal tract. Here they divide and multiply and the oocysts produced are expelled in the faeces and so the life cycle is completed. The coccidia live in the epithelial tissues of the intestinal tract. One oocyst destroys only a few cells so the degree of damage depends on the number of oocysts present but this soon becomes a large amount. Symptoms are ruffled feathers, loss of appetite and bloody droppings. This disease leads to poor FCR’s and lowered growth and in extremely high infections mortality. Upon doing a post mortem depending upon the species the intestines will have pin pricks of blood and the ceca are inflamed and have the appearance of boerorwors. For broilers the treatment is by prevention, by putting coccidiostats in the feed, as there is not enough time for them to build up immunity. Parent stocks are normally vaccinated. 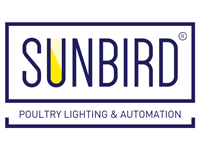 If there is an outbreak the birds can be treated with sulphonamides. Coccidiostats must be withdrawn 4-5 days prior to slaughter. Transmission from farm to farm is by rodents and man carrying it on their shoes. The picture below shows E.tenella in the opened caeca. This picture shows Eimeria necatrix in the small intestine. Note the pinpricks of hemorrhages showing. This is a disease caused by a fungus (Aspergillus fumigatus) which is either from the hatchery or from damp litter in the broiler house. It causes high mortalities in the first week of the chick’s life. Symptoms are gasping for breath. Treatment is by preventing the fungus from growing. Keep litter dry and ensure brooding areas and incubators are thoroughly cleaned. The litter can be sprayed with some chemicals which kill the fungus but fumigating with formaldehyde is not effective. 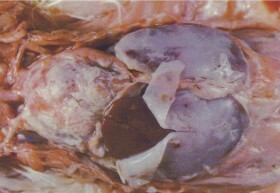 Post mortem results show nodules on the lungs as can be seen in the picture. This is a respiratory disease caused by an organism similar to a bacterium but has no cell wall. It is a disease in which healthy birds can be carriers, so once it has come onto the farm, subsequent placement of chickens will become infected unless measures are taken to eradicate it. It is also carried from the hen through the egg to the new chick. Most breeders vaccinate the parents against this disease. This disease does not normally lead to mortalities, but does lead to secondary E.Coli infection and mortalities from that. Incubation period is 2 – 3 weeks. It will often lie dormant until the bird becomes stressed and then multiplies rapidly. It can be treated with antibiotics, but new placements must be treated with prophylactic measures to prevent reoccurrence. (Tylosin is normally used) Blood tests can be taken to determine if the flock has this disease. Symptoms are snotty noses, watery eyes, coughing and sneezing. Transmission is from the mother through the hatching egg, through the air from one bird to another and via mechanical transmission on clothes, equipment etc. Strict Bio Security is needed to keep it off the farm. This is a respiratory disease caused by an organism similar to Mycoplasma Gallisepticum. It can cause airsacculitis but is normally found in the synovial fluid in the foot pads and hock joints. These become swollen and inflamed. Pus is often found in the foot pads. Birds become lame and it can cause drops in egg production but shell strength is not affected. Incubation period is 2 – 3 weeks. 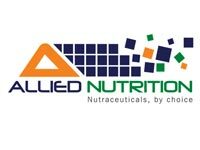 This disease can be treated with antibiotics but it is best to totally eradicate it with an all in all out program. Blood tests can be taken to determine the disease but it is good to send in birds with the symptoms to the laboratory. Transmission is the same as for Mycoplasma Gallisepticum.